Removing paint from the deck may reveal beauty underneath. 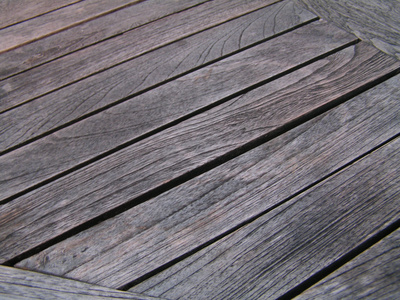 Once old deck paint begins to peel and get mildew, it can become an eyesore. Before you paint over it, though, consider whether you would not prefer to remove the old paint and reveal the natural beauty of the wood with a stain or oil finish. Paint can be more or less easy to remove, depending on the size of the deck and the number of coats. If you do not manage to get it all off in the end, you will at least have a properly prepped deck for new paint. Power wash the deck. Hook up the power washer to a garden hose and start the engine. You may have to experiment with different nozzles to find the one that is most effective. While spraying, keep the nozzle 6 inches or further away from the surface. Any closer and you risk notching the wood with the powerful spray. Let the deck dry completely after washing. Examine the deck and, if most of the paint is gone, you may be able to finish the job with a scraper. If a lot of paint remains, then use the stripper. Brush or roll the stripper on according to the specifications on the can. Let it work for about an hour, then use the power washer to spray it off. If a lot of paint still remains, apply the stripper again and this time brush over the stubborn paint with a wire brush. Spray the paint stripper off after an hour with the power washer. Let the deck thoroughly dry. Apply stripper over stubborn patches of paint and brush with a wire brush or scrape with a scraper. Wash the stripper off with water or, since you cannot overdo this, go over the deck again with the power washer. Let the deck dry. Sand any imperfections, splinters or protrusions with 120-grit sandpaper. The deck is now ready to refinish. If it becomes clear after the first power wash that the removal process will be too labor intensive, you may want to stop here and repaint the deck.